I came up with this craft because Chuck's current favorite 2 things are Lego and the movie Big Hero 6 . We also just visited Legoland for Spring break... and LOVED IT! Plus, we've watched Big Hero 6 at least a dozen times. So this was the perfect little toy to whip up. 1. First, I washed and dried a milk carton. 2. Then, I cut off the top pointy bit and two opposite sides of the milk carton. 3. Then, I ripped out two pairs of holes on opposite sides of the carton. I made them big enough to hold my pens. 4. Then, I taped the ends of a long roll of paper (I used this kind) onto each pen. 5. Then, we just turned the pens in one direction and watched our conveyor belt work! Once we finished, we had to decorate our conveyor belt! And here's a video of of our conveyor belt moving things along! 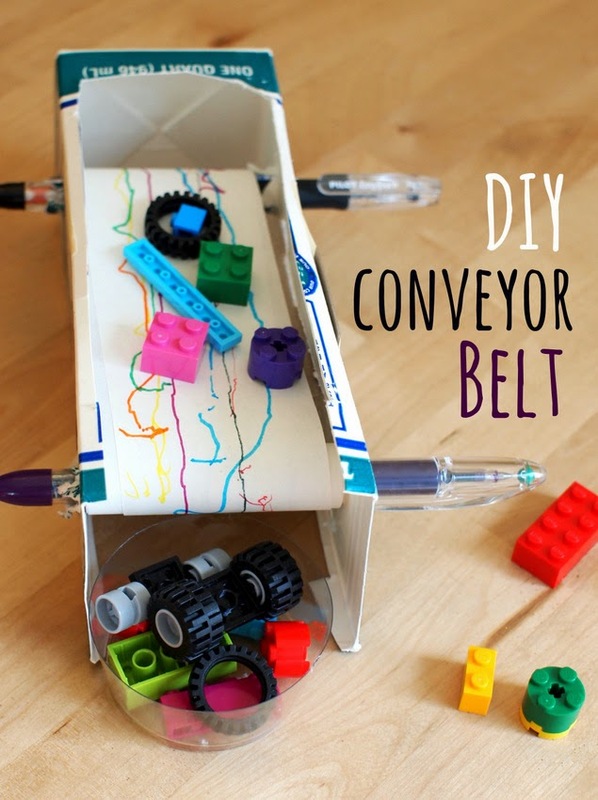 Lego Conveyer belt from Pink Stripey Socks on Vimeo.